Mary Howser – or “Air Mare” to those who follow her – isn’t your typical athlete and she doesn’t compete in your typical race. 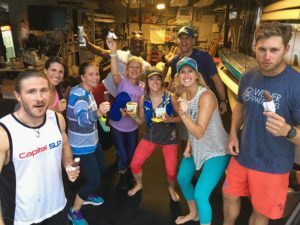 Mary is a part of a new trend in fitness competitions – paddleboard racing. 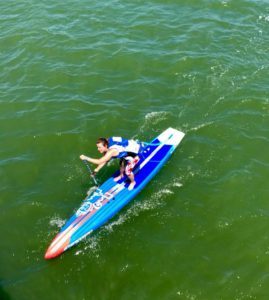 In addition to the strength, balance and stamina it takes to be competitive, the paddleboard phenomena is just as much about community as it is about the competition. Traveling, training and racing together, this tight knit group of stellar athletes becomes a second family of support and reinforcement. But just like any sport, the right fuel is one important piece of the puzzle. Mary and her crew are big fans of Diana’s Bananas Banana Babies and Banana Bites – they get all the right vitamins and minerals they need from the all-natural bananas, and all the reward they could ask for in the gourmet chocolate! Be sure to follow Mary’s paddleboard adventures through her Instagram account @air_mare. And check out this fun and energizing new trend in sports. According to Spoon University, the everyday food resource for today’s generation of college students on a mission to make food make sense, Diana’s Bananas is one of a few “killer brands out there producing healthy and sinfully delicious products that will help you satisfy your sweet tooth guilt-free.” Check out the other lucky brands to make this list, and see for yourself the full review on Banana Babies – as well as a great tip to make your smoothies even more delicious! Her 3 Little Thinkers didn’t have to think to long after discovering Diana’s Bananas Banana Babies. “When we saw Diana’s Bananas, we went bananas! 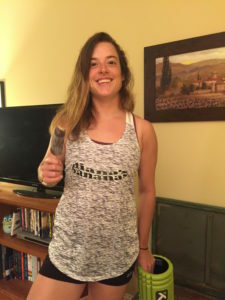 Instead of buying all the sugary, unhealthy popsicles, my kids can have a healthy frozen snack.” The family loved all flavors of Banana Babies, and the littlest couldn’t keep their hands off the Banana Bites – easy to grasp with little hands and easy to bite with sensitive teeth. You can read the whole review here, and you can find Diana’s Bananas in a grocer’s freezer near you. Popular blogger, Free For All, recently tried our delicious and nutritious chocolate covered frozen bananas and declared: “Diana’s Banana’s is a truly unique snack idea and great for gifts!” The blog review goes on to say Banana Babies are a perfect snack for her family of five and that she can’t eat just one of our Banana Bites, so it looks like this perfect gift may be harder to give away than originally thought! Can you blame her? One bite of our decadent delicious gourmet chocolate wrapped around a perfectly sweet and ripe frozen banana and you may not want to share either. Check out the awesome review at Free For All, and let us know if you agree! Give the gift of love, give the gift of chocolate covered frozen bananas!